One common reason for long-term knee pain is a type of arthritis known as osteoarthritis. It is thought to be caused by wear and tear in the joint. It affects mostly older people over 65 years. The knee bends and straightens smoothly because of the cartilage that covers the ends of the bones in the healthy joint. Long-term damage to this cartilage leads to osteoarthritis. Movement becomes restricted and pain gradually increases. The pain worsens on weight-bearing and is relieved with rest. Pain also comes on after waking up or following periods without moving. Movement reduces stiffness as well as self-massage. 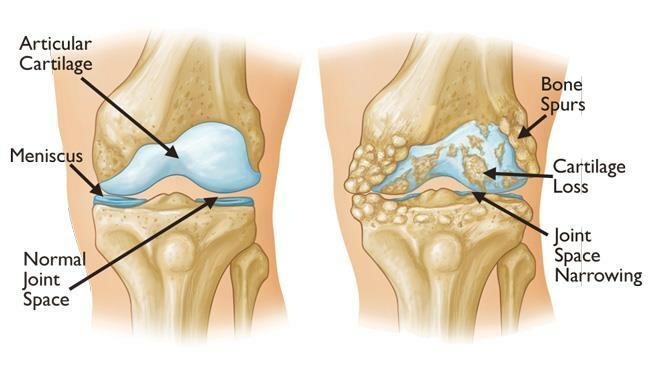 The image on the right is an example of severe knee osteoarthritis. Massage, including self-massage, may relieve knee pain. These should be done in a seated position with the knees pointing forward and the feet flat on the floor. Friction strokes are applied with no lubrication by pressing fingers firmly into the tissue and compressing a small area while moving the tissue back and forth using short strokes. Tap both hands with a soft closed fist rhythmically at the same time on the upper, then middle, then lower thigh. Repeat 10 times. Repeat sequence three times, taking three deep breaths. Seated, move hips forward, extend right leg with foot flat on floor and place heel of right hand on top of right thigh. Glide down using heel of hand. End at the top of knee and release. Bring hand back to starting position. Repeat this sequence 5 times. Now repeat the same sequence on the left leg, using left hand. Place heel of the right hand on top outside right thigh. Glide down outside thigh. End at the top of the knee and release. Repeat this sequence 5 times. Now repeat the same sequence on the left leg, using your left hand. Seated, place heel of the left hand on top inner right thigh. Glide down with heel of hand. End at top of knee and release. Repeat this sequence 5 times. Now repeat the same sequence on the left leg, using your right hand. Without lubrication, strokes are applied around knees. Press four fingertips firmly into tissue, compressing small area while moving tissue up and down using five short strokes around knee—bottom, outside, top and inside. Sit with both feet flat on floor. Place one hand palm down on each upper thigh. Glide down over knee caps across to outside thigh and up to starting position using light to medium pressure. Repeat five times. End with three deep breaths. An obvious knee injury caused by sudden trauma, such as from a road accident or a fall, may need immediate medical attention. A person should be checked by a doctor if there is considerable pain, deep cuts, swelling, or the person is unable to use their leg. It is important to get a diagnosis and treatment from a doctor if knee pain involves red, tender, warm, and swollen joints. If a swollen knee is very hot and painful, and if there are other general symptoms of feeling unwell, this is a time to get urgent medical help. The knee could be infected, and serious infection can be dangerous. This needs urgent hospital treatment. For more articles by Virginia Tortorici, click here.